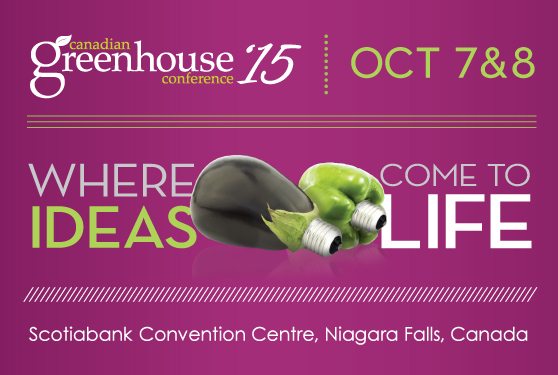 Plan now to attend the 2015 Canadian Greenhouse Conference - October 7 & 8 in Niagara Falls. The conference brings together growers, industry and the research community for education, networking and yes, a little fun. Check out the Canadian Greenhouse Conference Program & Preview Brochure At the CGC you will find people who understand your business challenges and are ready to offer solutions. From speakers to exhibitors to fellow growers - this is your chance to establish and strengthen business relationships that can benefit you professionally and personally. Register now for sessions, workshops and the bus tour. Extend your experience to include The Gathering - the CGC social event you won't want to miss. Held at the beautiful Edgewaters Restaurant, enjoy the Taste of Canada menu while taking in the panoramic view of the falls. Don't delay - tickets are available in advance only. Be sure to book your room at the CGC headquarter hotel. With its convenient location, full buffet breakfast, discounted parking, and free Wifi, the Marriott Gateway on the Falls offers tremendous value. Avoid disappointment and book your reservation today. Complete conference details and booking links available at www.CanadianGreenhouseConference.com.